I had a long hiatus from comics, from the time I left home in 1988 to around 2004, during which time I kept a sporadic eye on my first love, the Legion, but wasn't aware of anything else happening in the comicverse. When I "came back", I had a lot of catching up to do: not only did I miss out on an extreme number of shoulder pads, costumes with pouches and foil embossed variant covers, but the introduction of a lot of new key players, particularly in the X-Verse. Some I came to quickly love, some I came to quickly detest and some I just couldn't relate to. I'd put Cable in that third category. He'd been rescued from Liefeld-esque hideousness by the time I met him, but having missed his introduction I'd always struggled to understand his place in the X-Men World until the recent Messiah War storyline. It was a big surprise, then, when I happened upon the full-sized Cable (Modern) Statue from Bowen Designs, that I liked it so much that I just couldn't get it out of my mind. I passed it on two separate occasions, but on a third viewing I found myself taking it home. I love Bowen Mini-Busts but have stayed away from the Statues to try and avoid that particular slippery slope, but had recently decided that the Modern Emma Frost Statue would be my first. Much to my surprise, Cable has beaten her to the punch! Plainly put, this is just an extremely impressive looking statue. 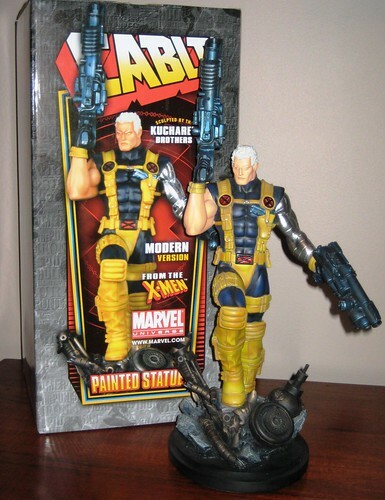 I really like Cable's stance, the colours used, and his very cool guns. This is a beautifully designed and painted piece. His techno-virused left arm is well done - nice and shiny, which is set off nicely by the use of mostly matte paints on the rest of his costume. It's a tall statue - 16" to the top of his raised gun. There is some assembly required. 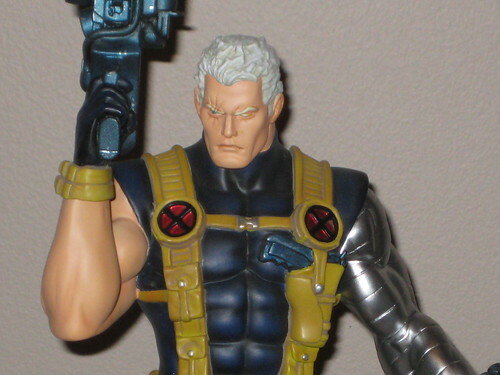 Cable's guns are separate pieces which include his hands, which slot in at the wrists and are cleverly held in place with the use of magnets. The guns are impressive looking pieces with a bit of a worn look - they've clearly seen some action! The base is also a separate piece, with just one attachment, a long peg from the left leg which goes into the base, while the right foot rests atop the raised section of the base. A peg in the right foot wouldn't have gone astray - I was surprised to find the statue is a tad wobbly. Nothing drastic, but surprising for the price point. So, my personal ban on FS Bowen Statues has been broken early than I planned. Sadly I've had to re-box Cable momentarily as he's too tall to fit on any of my shelves in their current configuration. Ah well, it was time for a refit anyway! You can see more pics at Facebook, discuss this on the AFB Forum, and comment on this post to enter the March AFB Comment of the Month Contest! ** This month only, an AFB Facebook Fan will win an additional prize - become a fan now! I think Cable's purpose will almost always make sense when there's a story involving Stryfe or Apocalypse brewing. When those two are off the board, he becomes "generic guy from the future waiting to help the X-Men through their next big crisis". That said, it's a very good statue, and it's a good look (rather than the horrible Liefeld based design where he looks so out of proportion he should be in the circus). OOOOh magnet guns, I am such a sucker for fancy engineering in my toys (or statues). This statue doesn't contain nearly enough cheesecake however. I do need to search for Bowen's The thing bust.